Commonwealth v. Charles Hicks, Jr.
On November 18th, 2014 Charles Hicks, Jr. was sentenced to death by the jury who had convicted Hicks of murdering and dismembering Deanna Null in January of 2008. 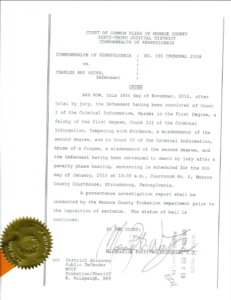 Jury selection began on October 27th, 2014. First Assistant District Attorney Michael Mancuso, a dynamic homicide prosecutor who has tried more than two dozen previous murder cases, began opening arguments on November 5th. Attorneys Jason LaBar and Robin Spishock represented the defendant. Attorney Mancuso presented more than 100 pieces of evidence and examined more than 35 witnesses during the three week trial. It took the jury little more than an hour to convict Hicks. On January 29th, 2008 Pennsylvania Department of Transportation workers discovered body parts along Interstate 380 in Coolbaugh Township. State Police investigators discovered additional body parts along Interstate 80 in the borough of Stroudsburg. The victim, Deanna Null, an acquaintance of Charles Hicks, Jr., was identified through dental records. State Police investigators uncovered overwhelming evidence linking Hicks to the recovered body parts. A search warrant executed on Hick’s home resulted in the discovery of Deanna’s severed hands, wrapped in old newspapers, zip-lock plastic bags and socks filled with detergent concealed around bathtub plumbing. At the beginning of the trial the defense made a surprising admission – Hicks was guilty of dismembering and scattering Deanna’s body parts. But Hick’s, through his attorneys, claimed that Deanna died of a drug overdose while visiting and Hick’s panicked, dismembering and scattering her body in an attempt to conceal the ‘true’ cause of her death. However, prosecution forensic pathologist Wayne Ross testified that Deanna’s injuries, including lacerations and bruises, some likely created when beaten by a long cylindrical blunt object, was the cause of her death. The defense attempted to bolster their theory by eliciting testimony from Dr. John Shane, a forensic pathologist from Lehigh County. 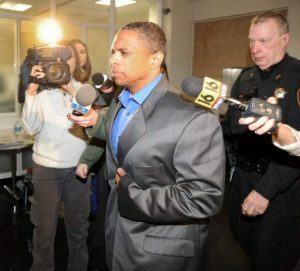 Dr. Shane claimed that the injuries sustained by Deanna were the result of her body being dragged across a surface and to Deanna’s alcoholic condition causing her to easily bleed. The jury rejected Dr. Shane’s testimony as not credible. In a bizarre connection between Hicks, who grew up in the Tarrant County Texas area, and the manner in which he kept Deanna’s severed hands as a grisly keepsake, Hicks chose to wrap the victim’s left hand with a newspaper article about a murdered woman in Tarrant County, Texas. Hicks is to be formally sentenced on January 6th, 2015. Based on other evidence, including statements he made to Texas Rangers, Hicks is suspected in the killing of between five and ten other women in Texas and Colorado. 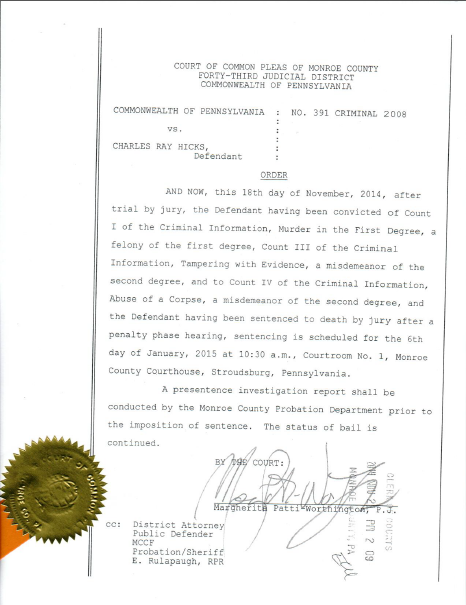 As a result of the investigation and conviction of Charles Hicks District Attorney E. David Christine, Jr. has awarded special recognition to the prosecution team including First Assistant District Attorney Michael Mancuso, County Detective Wendy Serfass, Pennsylvania State Troopers Jody Radziewicz, Thomas Slavin, Robert K Sebastignelli, Craig Vanlouvender, John Corrigan and retired Trooper Philip Barletto.